In my practice, I always perform oral exams on my patients. More often than not, I see those pesky “silver” fillings called Amalgam. Its chemical composition consists of 50% silver alloy and 50% liquid mercury and has been the dental industry’s main filling material since the early 19thcentury. As you know, mercury is a toxic substance and is a health concern in many aspects of our lives, and amalgam is no exception. Mercury, in all of its forms, is one of the most toxic substances known. It damages nerve cells, kidney tissue and blocks many important biochemical reactions in our bodies. In other words, it is a true poison. To our disadvantage, amalgam fillings constantly release or “smoke” mercury vapor even without any provocation. Chewing, drinking hot liquids, or eating acidic foods will further exacerbate it. This video from the International Association of Oral Medicine and Toxicology (IAOMT) shows an example of this. The tooth containing amalgam is rubbed to mimic the conditions in your mouth when you chew food or drink a hot beverage. The World Health Organization has concluded that the largest source of mercury exposure for people is amalgam fillings (excluding occupational exposure). Mercury vapor is absorbed by the body in many ways. It passes through the cheek lining, and is absorbed by the lungs. It can also be taken up by the smell nerves in the nose, which conduct it directly to the brain. Mercury from fillings is converted by oral bacteria into organic methyl-mercury and crosses the blood-brain barrier. No specific diseases have been directly linked to mercury from fillings. However, chronic exposure to low levels of mercury has been shown to produce dysfunction in the nervous system, kidneys, heart, liver, endocrine glands (thyroid), digestive tract, and immune system in humans. The history of massive methyl-mercury exposure and poisoning in both Minamata Bay, Japan and rural Iraq caused severe neurological and neuromuscular damage (ranging in severity from chronic illness to death) and severe birth defects. When mercury from fillings gets into the large intestine it damages beneficial bacteria and promotes overgrowth of pathological yeast. I often see patients with amalgam fillings and chronic candidiasis. As with many metals, mercury is allergenic. Five percent of the population show a true allergy to it and up to 85% of the population show some type of antibody reactivity. 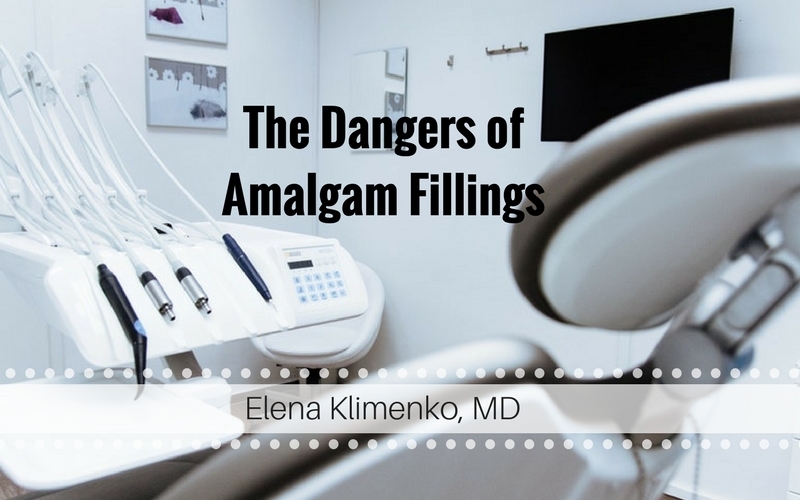 While there are scientific arguments both for and against amalgam fillings, it is not possible to surely predict who may largely benefit from having existing amalgams removed or replaced. This is just a presentation of available information, and the decision should ultimately be a personal one made in conjunction with a knowledgeable healthcare professional. I strongly support my patients’ oral health and encourage them to see biological dentists to discuss the option of amalgam fillings removal as an important step towards reduced toxins exposure. When my patients decide to remove amalgam fillings, I always advise them to see a biological dentist. The reason for that is simple: regular dentists, though well trained and skilled to handle toxic material of amalgam outside of your mouth, unfortunately are not always equipped to protect you and everyone around from vapor of drilled amalgam fillings. Imagine, as the dentist starts to drill the old amalgam filling the small particles and vapor starts flying all over your mouth. You and everyone else risk inhaling it. The small particles falling into your mouth are quickly absorbed into your blood through the cheek lining. The vapor that the dental assistant can quickly capture with the suction instrument now comes out from another end and spreads all over the room, exposing staff and other clients of the regular dental office to the vapor. This study shows air and furniture surfaces contamination with mercury vapor in the regular dentists’ offices. Everyone strives for better health. If you are ready for a comprehensive evaluation and exam by a certified functional medicine practitioner, click here and find a practitioner near you. Elena Klimenko, MD, a certified functional medicine physician, will help you choose the right course of action to identify the root cause and relief your unsettled symptoms. Call today to find out more about functional medicine and speak with Dr. Klimenko at 212-696- HEAL(4325). If you want more information about Functional Medicine, contact us to receive a FREE copy of Dr Klimenko’s E-book.